hot button topic in this coastal California drama. I promise you will never perceive a raven the same way again. Available in bargain hardcover or quality paperback. T.C. Boyle's most powerful and fully realized work yet-"terrifically exciting and unapologetically relevant" (The Washington Post). Principally set on the wild Channel Islands off the coast of California, T.C. 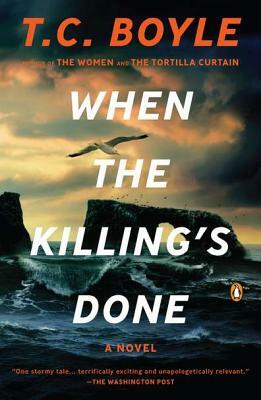 Boyle's new novel is a gripping adventure with a timely theme. Alma Boyd Takesue is a National Park Service biologist spearheading the efforts to save the islands' native creatures from invasive species. Her antagonist, Dave LaJoy, is a local businessman who is fiercely opposed to the killing of any animals whatsoever and will go to any lengths to subvert her plans. As their confrontation plays out in a series of scenes escalating in violence, drama, and danger, When the Killing's Done relates a richly humane tale about the dominion we attempt to exert, for better or worse, over the natural world. T. C. Boyle is the author of eleven novels, including World's End (winner of the PEN/FaulknerAward), Drop City (a New York Times bestseller and finalist for the National Book Award), and The Inner Circle. His most recent story collections are Tooth and Claw and The Human Fly and Other Stories.